Perfect for party bags or favours. Spiral bound notepad, 2 rubber tipped pencils, pencil sharpener & eraser. Whether you need a stocking filler or a party bag gift, this stationery set is perfect. 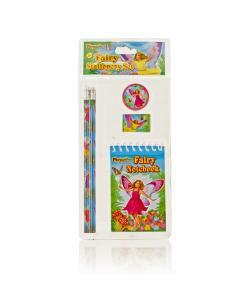 The set has a design featuring pretty fairies that all children will love and includes a spiral bound notepad, 2 rubber tipped pencil’s, eraser and pencil sharpener, everything they need to write or draw for hours.